This post is not about pets and preferences. This post is about one of the best examples of how human behaviour affects the environment. House cats are one of the few animals which have widely been accepted in people’s homes. This acceptance is part of human civilisation and probably started in ancient times. In some cultures cats are highly appreciated and sometimes even part of the religious stories that are still relevant. I grew up with house cats. I grew to like them and I also grew to find them more and more interesting. Like humans they can life solitary but prefer company. Like their owners, they have behavioural patterns and sometimes little characteristics that make them unique. Also house cats appreciate kindness and comfort and can reward that with loyalty, to an extent. “To an extent” is how I ended the previous sentence. I have a reason for that. House cats by their nature and instinct can adapt and blend in. They have been adopted into houses for their pest control capabilities, relative cleanliness and socially likeable behaviour. At the same time they are still hunters and predators with their own little territory and patrol routes which they inspect and mark on a regular basis. The relationship between the house cat and its owner is comparable to how people treat their natural environment. When you let the house cat be and treat it kindly, it tends to adapt to you. When you try to control it, it will resist and run off at some point. The natural environment with its resources and phenomena is very much like that. Over the years I have read more and more about history, ecology, human civilisation and how human behaviour has affected the earth and other people. When I think of how to explain certain aspect of those topics I think of the half-domesticated house cat. This relationship between people, their behaviour and the house cat is quite telling. Treat your house cat badly and it will at one point disappear. Treat your environment badly and it will be gone. The best example is the origin of deserts. Cultures over-exhausted their natural environment beyond recovery and it vanished. P.S. The cat on the picture is one of my favourite cats. 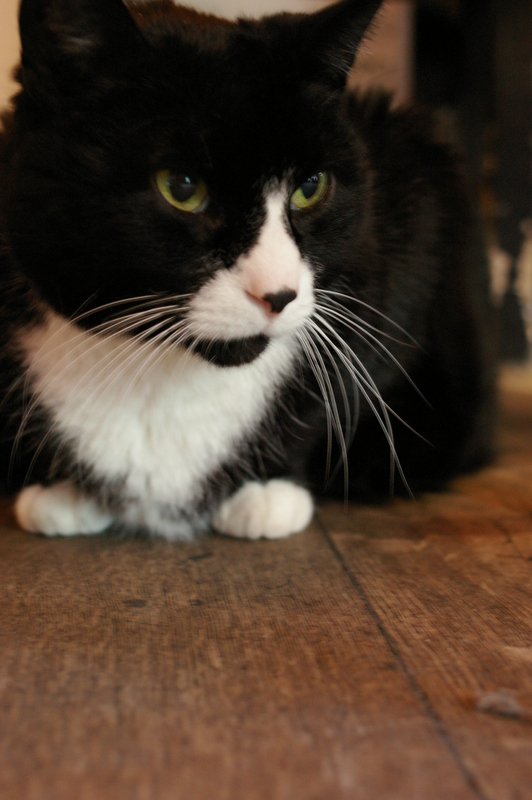 It prowls around in an Amsterdam café. Posted in Photos and tagged behavioural patterns, cats, characteristics, civilisation, earth, ecology, history, house cat, house cats, human, human behaviour, instinct, natural environment, nature, people, relationship, to adapt on April 6, 2015 by rura88.